PACT indicates Patient Aligned Care Team. Despite widespread adoption of the patient-centered medical home (PCMH) model, it is unknown which components are most related to clinical quality.1,2 We sought to assess the association between elements of the PCMH model and clinical quality in the Veterans Health Administration’s (VHA’s) national PCMH initiative, the Patient Aligned Care Team (PACT) program. 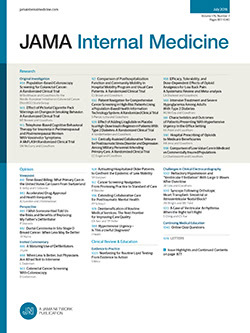 In a patient-level observational study, we included veterans who received primary care from fiscal year 2012 to 2014 and had their medical records abstracted by an independent, external contractor for the External Peer Review Program (n = 422 125).3 We used External Peer Review Program data for 48 clinical quality measures for chronic disease management and disease prevention that are comparable to Healthcare Effectiveness Data and Information Set measures. We gauged clinic-level PCMH implementation in 2012 for 909 clinics using the PACT implementation Progress Index (Pi2), which includes 8 core components (access, continuity, care coordination, comprehensiveness, self-management support, patient-centered care and communication, shared decision making, and team-based care).4 We modeled the association between quartile of the Pi2 component and the 48 clinical quality indicators using generalized estimating equations for binary outcomes (modeled jointly), accounting for within-patient correlation across quality measures and adjusting for multiple comparisons.5,6 We calculated mean marginal effects to report differences in the probability of meeting clinical quality between the highest- and lowest-quartile Pi2 component scores. To estimate the full adoption of PACT throughout the VHA, we calculated the number of patients who would have met each quality measure if they had been cared for in high-Pi2 clinics, given model results, and the number of patients in the VHA primary care population eligible for each measure in the low- and medium-Pi2 clinics in 2014. The evaluation efforts are part of an going quality improvement effort at the VHA and are not considered research activity; they are thus not subject to institutional review board review or waiver. Overall, higher scores on each of the 8 components of Pi2 were associated with better performance on clinical quality indicators (Figure). The Pi2 components that were most strongly associated with a clinic meeting the most clinical quality indicators were care coordination, access, continuity, and communication. Clinics with high care coordination performed significantly better on 33 (69%) of 48 quality measures compared with clinics with lower scores. Similar results were noted for access (32 [67%]), continuity (29 [60%]), and communication (25 [52%]) (Figure). When extrapolated to the entire VHA primary care population of 5.4 million patients, 310 468 additional high-quality care services could have been delivered if all clinics performed similarly to high-quartile clinics for care coordination. We calculated similar potential effects on quality metrics for access (n = 258 999), continuity (n = 253 816), and communication (n = 285 193). Although all components of the PCMH model contributed to better performance on clinical quality indicators, those with the strongest association were care coordination, continuity, access, and communication. When we applied the probabilities to the full primary care population, substantially more high-quality care services would have been delivered if adoption of PACT at all clinics was commensurate with the high-quartile clinics. If these differences were sustained over time, the health benefits accruing to the population would be sizable. The strengths of our study include a broad range of process and outcome clinical quality measures for a large and diverse patient population served by primary care clinics varying in size and geographic location. This study has several limitations. This was an associational study that does not permit causal inference, and confounding cannot be excluded. Clinical quality at baseline was high, potentially obscuring improvements attributable to PCMH components. We found that higher performance on each Pi2 component favored improved clinical quality. This was especially true for continuity, access, care coordination, and communication, which are hallmarks of effective primary care practice. Initiatives to improve primary care should focus on these important domains. Corresponding Author: Karin Nelson, MD, MSHS, VA Puget Sound Health Care System, 1660 S Columbian Way, Seattle, WA 98108 (karin.nelson@va.gov). Accepted for Publication: March 3, 2017. Author Contributions: Dr Nelson had full access to all the data in the study and takes responsibility for the integrity of the data and the accuracy of the data analysis. Study concept and design: Nelson, Sylling, Taylor, Mori, Fihn. Acquisition, analysis, or interpretation of data: Nelson, Sylling, Taylor, Rose, Fihn. Drafting of the manuscript: Nelson, Sylling, Mori, Fihn. Critical revision of the manuscript for important intellectual content: Nelson, Sylling, Taylor, Rose, Fihn. Statistical analysis: Nelson, Sylling, Taylor. Administrative, technical, or material support: Nelson, Mori, Fihn. Additional Contributions: Data for this report were developed by the national evaluation team at the Patient Aligned Care Team Demonstration Laboratory Coordinating Center and the Office of Clinical Systems Development and Evaluation, Veterans Health Administration. Idamay Curtis and John Messina, US Department of Veterans Affairs, assisted with data acquisition and administrative support. David Katz, MD, US Department of Veterans Affairs, provided comments on the original manuscript.